From endless pineapples to gorgeous sunsets, Maui is one of our favorite places to visit. On a recent trip, we popped by to visit raw food chef-turned-mixologist Kerry Mekeel at Hotel Wailea‘s hip pool area, aptly named The Cabanas. Not only is the mega babe mixing up her very own recipes, but her uh-mazing farm-to-table cocktails are also crafted with handpicked island fruit, fresh-pressed juices, organic hydrosols, local spirits, and more. They’re seriously some of the best cocktails we’ve ever tasted. 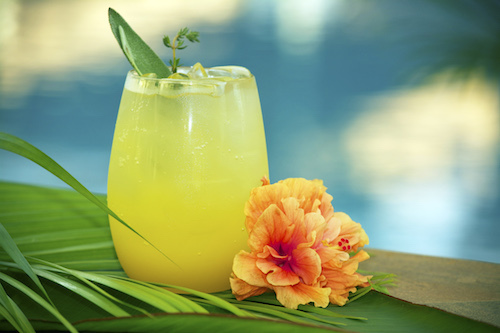 In the case you can’t hop on a flight to Maui to taste for yourself, Kerry gave us three of our favorite recipes from the bar to re-create at home–including her take on the Mai Tai, which is a version that will help keep the hangovers away! And while you might not have the salt air and palm tree vibes going on, they’ll have you instantly thinking you’re on a tropical island. 2. Add the light rum, Amaretto and fruit juices. 3. Shake well, then pour into a glass. 4. Float the dark rum on top and garnish with mint, lime and pineapple spear. 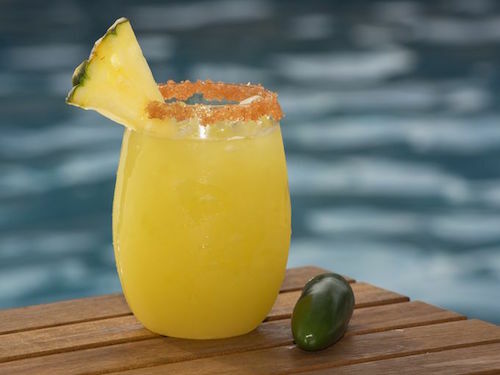 Kerry’s fun fact: The Mai Tai is not of Hawaiian origin, although it is the go-to drink for most visitors to our islands. It was brought to Hawaii in 1953 by Californian restaurant owner Victor J. “Trader Vic” Bergeron, who originally crafted the cocktail at his Oakland restaurant in 1944. 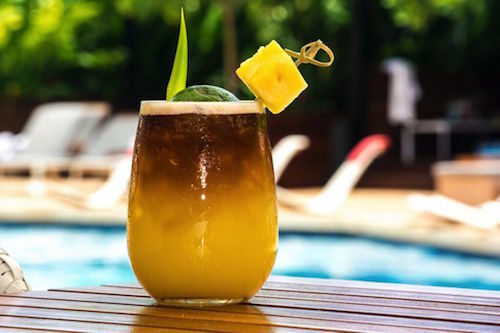 The drink’s name comes from Trader Vic’s Tahitian friend Carrie who, on first sip, exclaimed “Mai Tai – Roa Ae,” which in Tahitian means “out of this world–the best”. 1. Blend together 1 cup of organic cane sugar, 1 cup of purified water, and one large whole jalepeno with the stem removed in a Vitamix or other high power blender until mixture is completely liquified. 2. As the syrup sets and chills in fridge, it will become more viscose and become a deep green color and the flavor a rich earthy heat. 1. In a 12 ounce shaker, add tequila, fresh juiced lime, jalapeño syrup, and fill with ice. 2. Top with fresh pineapple juice, (or canned juice if pineapples aren’t available), shake, and pour into a 12 ounce glass rimmed with red clay or pink Himalayan sea salt for color contrast. Kerry’s insider tip: for the perfect salty rim, dip the rim of the glass in small plate of honey, and then into the salt mixture. The salt will stick to the glass easily and the honey adds a great flavor dimension to the spicy jalapeno. 1. To make fresh lilikoi juice you need 1 lilikoi per 1 cup of water. 2. Use all of the insides of the fruit: seeds, pulp, & juice. 3. To sweeten, you can use organic cane sugar, pure honey or agave nectar (if you use sugar, add 2 Tablespoons per 1 fruit/1 cup water; if you use honey/agave, use 1 tablespoon). 1. Add all ingredients into a glass, then shake and pour. Kerry’s expert tip: lilikoi can be too tart for some, so make sure the fruit is in ripest stage. Also, add more or less sweetener according to your personal taste. And next time you’re in Maui, whether you’re staying at Hotel Wailea or not (which we highly recommend you do so! ), be sure and stop by The Cabanas for a cocktail or three. You and your taste buds won’t regret it!